Justin is an amazing husband and dad. In fact, he’s amazing at a lot of things which can get a little annoying once in a while. But, you know, I suffer through his perfection. So, it is Justin who has inspired this post, along with a little group I like to write for. Two Writing Teachers (https://twowritingteachers.wordpress.com) hosts a blog share every Tuesday called “Slice of Life”. We are invited to write about a little snippet of our personal or professional lives. I was going about my “normal” life, shaking my head because of the insanity of it all, when I realized I should share my experience from this morning to show just how *special* Justin is, and to let you all in on the chaos that I call normalcy. Since we are Amazon Prime members, we receive packages at least once a week. Diapers, running shoes, tools, diamond jewelry; you know, all the regular stuff. Justin likes to make ginormous contraptions for the children out of the cardboard boxes. We currently have a fort that takes up half of our three-season room, an airplane, and a box specially designed with a section for each child, which of course they couldn’t get the hang of, so they tackled each other inside it until the box broke. You see? Justin is full of good ideas. Already I’ve shown you that he has cluttered up our home with trash AND caused the kids to fight over real estate in a box. My dear husband, in his infinite wisdom, had the perfect solution. He would write “Harrison” on one, and “Ella” on another. With the remaining two, he wrote, “SHARE”. You guys, my kids can’t read. They’re freaking brilliant, but they can’t read yet. And they definitely cannot share. The fighting over Styrofoam did not end; it just resulted in a brief pause to ask me what each piece said, presumably so each kid would know how to annoy the other one faster. But THEN! He went to work. Justin went to work this morning and left me with the Styrofoam and pre-literate people who could not read or share their Styrofoam pieces. And, all before preschool, something amazing happened. We had our first snow of the season. In the house. Because, you know what’s fun? Ripping up Styrofoam into little tiny pieces and scattering it around the house. Yeah, it looks like snow. And we haven’t had snow yet, so obviously we should make some ALL OVER THE HOUSE BEFORE 8 AM. I left the house bewildered and embarrassed at the thought that I was leaving behind such a mess, but that early in the morning, I was too angry at Justin and his bright ideas, and too tired to do anything about it. I do love him. But I do wish he’d think things through, like our children’s reading levels. And the appropriateness of play things. And the repercussions of his brilliance. When I was a little kid, or even a big one, I had no idea what a veteran was. I mean, my parents did a good job of educating me about the fact that these were people who fought for our country, but I just didn’t get it. I remember watching Charles in Charge, where the grandfather on that show was a veteran. He was portrayed, in my memory, as fierce and closed-minded. This is not someone I wanted to make a connection with. This is not someone I wanted to understand. I didn’t understand much about war or freedom because, quite frankly I was a spoiled white kid in a good neighborhood who had parents that didn’t advocate war. Going into the military was never even a consideration in my household. Do I resent them for that? No. Do I wish I had asked more questions? Yes. Now I’m an adult. Not just an adult by age, but a person who thinks more critically and thoughtfully than one in adolescence, or early adulthood. I was forced into this mindset of wondering “why” more often, because there are two little people asking me that question All.The.Time. The other major problem with my comprehension of this day is that I did not know many, if any, veterans when I was young. Yeah, I knew some veterans, but I didn’t really know what they had done. I thought they were all similar to Walter Powell, that grouchy grandpa. But then, graduation came, and one of my best friends in the entire world enlisted in the Marines. He came back, thank God he came back. But he was not the same. He lost in those years the wholesome playfulness that I adored. He became a stronger person, a man. But a man who knew too much anger and saw too much sadness. Then there was my cousin. He is the baby out of almost 30 of us cousins. And I asked myself time and again, how did our baby become so strong and so brave? Then there was my teaching partner, the man I taught beside for almost all of my teaching career. He was the epitome of a military man. We didn’t talk about it much, but I knew that you didn’t just come out of the womb that diligent, that focused, that disciplined. His work ethic is unmatched. His faithfulness to all people he cares about is remarkable. I was thankful every day that the students we shared could know a man who had done so much for our country, and then come back and serve in the classroom. When I ask myself, “Why?” I will not know the answers that my friend Jimmy gave himself when he went into service. I will not know how my cousin Dan got so brave. I will not know what my teaching partner, John, experienced in the Marines. But I do know that because of them, my children are safe, and when Harrison asks about monsters, I can tell him there aren’t any here. And now, when I ask, “Why a poppy?” I can answer myself: A poppy represents the lives given for the freedoms we have. Author livefromtimeoutPosted on November 11, 2015 February 3, 2016 Categories Uncategorized6 Comments on Why a Poppy? 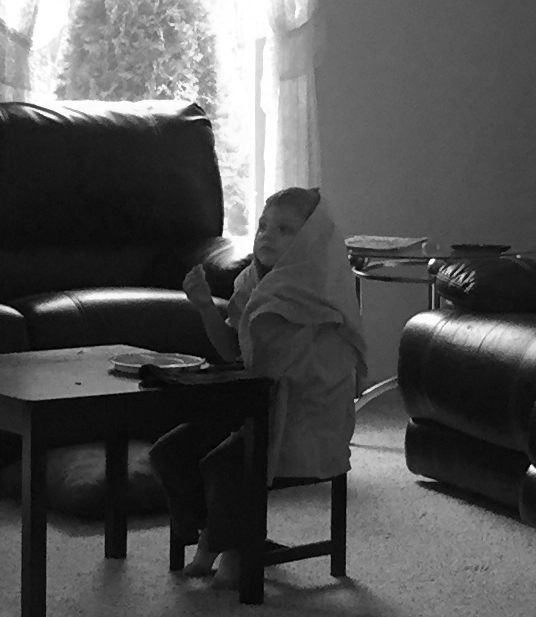 He’s sitting over there in front of the television; blanket over his head, mowing down dinosaur shaped chicken nuggets. He’s happy as can be, dipping his nuggets into ketchup, eyes fixed on Rescuebots. Today is a special day. I have allowed him to eat his lunch in front of the television, something I NEVER do. He squealed with delight when I moved his little table in front of the TV screen and set his plate down. “Mama! Why do I get to eat my lunch here?” he questioned. I told him it was because I love him. He grinned and took his seat. As I looked over at my happy (and quiet, for once) little boy, I realized what a grave mistake I had just made. I just told him he got to do something special because I love him. Now, what am I going to do on all the other days (which will likely be all days until the end of time) that he is NOT allowed to eat his lunch in front of the TV? Is he going to think that I love him less on those days, or will he understand the value of a recently vacuumed floor? Is three years old too young to grasp “special occasions”, even if those special occasions are simply random Tuesdays when Mommy is in a good mood? When I was pregnant with Harrison, I used to play him a song. I think this is common practice for lots of moms. I didn’t do it because playing music is supposed to make your babies geniuses. For that, I figure we’d just hold our breath and hope for the best. That song, Adele’s “Make You Feel My Love”, has one line in it that I had to listen to over and over. Somehow, this song came up in conversation with Harrison a few days ago, and now he asks me to play him “his song” over and over. He even asks me to sing it. I.Cannot.Sing. But he loves it. I will continue this practice until he just cannot even take the sound of my tone-deaf voice anymore. And then I’ll pray that he will dance with me to that song on his wedding day. I could hold you for a million years. I worry about car seats, and grapes that aren’t cut small enough, and poisoning and drowning and disease. But then they’re going to grow up, and it’s not choking on food, or walking out in the middle of a busy street anymore. It’s college and partying, and broken hearts, and failure. Just the other day, there was a news story about drug abuse that featured parents who lost children to heroin. Justin looked at me and said, “That is one thing I worry about in our town. There is quite a bit of drug use here among teens.” Excellent, dear. I wasn’t worried enough already. And all along, I know there are thousands of other dangers that I haven’t even thought of yet. And what about me! Every SINGLE time I get in my car without the kids, I wonder if I’ll make it back safe. Every health ailment is a warning that my time with my babies is limited and precious. Because all we can do is be the best parents we know how to be in each moment that we are lucky enough to have our children in our arms.